If you are a frequent follower of health related blogs and media, I think there’s one thing you and I can agree on, which is the frequency of disagreements. I’ll state my biases up front. I tend to follow sources in two categories: either personal journey, autobiographical writing that I find inspiring or creative, or health information I find credible and science/evidence based. For me, the two rarely go together. That’s not a value judgement, I’ve just found that the two types of content rarely occupy the same space, or maybe even the same mental space. I have met people online, and made friends online, simply because we connected on a personal or emotional level based on common experiences, and felt less alone. That’s cool. I also read a lot of stuff that is much more impersonal. Research papers, critiques of papers, medical blogs and online communities of researchers or doctors who debate current hot topics. This is a whole different beast. Discourse here is around the scientific merits of an argument or claim, for instance. It’s often clinical or academic in nature. It employs language and speaks in a voice that immediately puts the reader on notice that “educated minds are at work here”. It is perhaps ironic that discussion on these sites is often more vitriolic than anywhere else. This has never been more apparent to me than in recent weeks, reading the information that has overrun our medical science forums, as well as our media outlets, around the debate in North America on whether or not to vaccinate children. This has become prominent due to recent measles outbreaks, a disease that was considered eradicated in North America in the year 2000. This is a theme of debate that we see often in health advocacy circles. How far does my personal right to decide my own healthcare actions extend, if I live in a society that pays, either literally or figuratively, for the outcome of my choices? What rights have I over my own body, or those of my dependents? Where is the place in healthcare for my own opinion, values, beliefs, in comparison to expert opinion? What are my rights, and what obligations do those rights bring along with them, if any? We can see the fingers of this theme reaching into most health debates, such as vaccination, assisted suicide, abortion, or alternative healthcare practices. I see many experts out there passionately working to debunk ideas they find dangerous, or not evidence based. They rake popular media personalities like Dr. Oz, who all medical experts love to hate, over the coals for endorsing unproven health interventions, sometimes it seems, for personal gain. I don’t disagree. But you know what I think we need? More experts writing and communicating for the layperson. What I think is lacking out there is good, reliable information that is intended for general public. Experts arguing with experts in a very tall tower somewhere don’t help us make decisions; and the reason so many people are willing to believe the “bunk” is that it’s presented on pretty websites with wholesome images, in simple language that seems to make intuitive sense. David Vaughan Icke (born 29 April 1952) is an English writer, public speaker and a former professional footballer and sports broadcaster. He promotes conspiracy theories about global politics and has written extensively about them. Icke was a BBC television sports presenter and spokesman for the Green Party, when in 1990 a psychic told him that he was a healer who had been placed on Earth for a purpose, and that the spirit world was going to pass messages to him. In March 1991 he held a press conference to announce that he was a “Son of the Godhead”. Now I ask myself, “is this a guy I want to take medical advice from”? Nope. 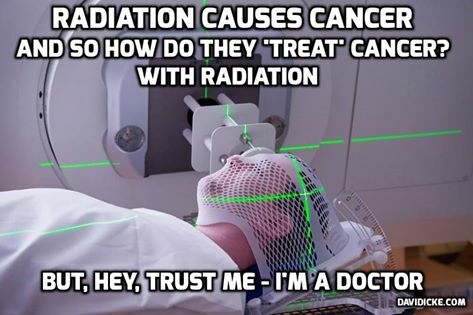 Then I ask, “do I feel like this is an issue I may want to research further, because even if this guy doesn’t pass my smell test, there may be other opinions out there on the safety or long term effects of radiation therapy that I do want to consider”? Sure. See, to me, that’s the process of critical thinking. To me, we have a responsibility to participate in our own healthcare, and how we do that is by educating ourselves on options and making the best, most responsible choices we can. My choices may not look the same as yours, and I think that has to be okay. But they should be based on credible rationale and information, or else I should just listen to my doctor. And if my choices are based on credible rationale and information, I want doctors who will also listen to me. And EXPERTS – it would be really helpful if you could kind of compete with the vocal and ubiquitous nutters by taking a time out from your debates with one another and putting some information out there for the general public to find and rely on that is credible. Make it accessible, simple, understandable. Remember what your mother said – “If you’re not part of the solution, then you’re part of the problem.” Or maybe that was Eldridge Cleaver. And maybe he’s not a guy we really want to listen to anyway. I don’t know, Google it and make your own decision on that. Maybe a better quote is from perennial favourite, Albert Einstein: “If you can’t explain it simply, you don’t understand it well enough”. re: … what I think we need? More experts writing and communicating for the layperson. All of this is going to seriously damage the public credibility of the “experts” supporting consensus views, and they earned it. It may be decades before they recover (and then only if we get some long overdue apologies, and frankly I don’t see that happening). re: … if I live in a society that pays, either literally or figuratively, for the outcome of my choices? That’s another problem that could be fixed by simply eliminating the entitlements (and before it’s too late, eliminating the coercion that comes with them). Show me that experts and authorities don’t fall prey to confirmation bias and cognitive dissonance and maybe I’ll be a little more trusting. Until then they can write what they want, I’ll still most likely believe what’s worked for me. I’m still smarting over the cancer researcher who flat out told me “diet doesn’t matter”. These guys are all that. I have difficulties with my own biases. And despite this we are living longer! Thanks for this post. Excellent thoughts. Here’s the thing about “experts” that I think a lot of us miss: researchers, doctors, medical specialists, they’re people. Some of them are good at what they do, some are not. Some are good at what they do, but terrible at communicating it. Some are poor at what they do, but still get published. So we have to think critically about who we trust, what information we trust. It’s not easy. It’s very, very hard, particularly when you or someone you love is suffering a health crisis. But to say that all doctors are bad or evil, or no researcher knows what she’s talking about, that’s biased. The challenge is finding the good ones, who care, who do good work, and who can tell us about it.